Yoenis Cepsedes left it all on the diamond Wednesday night — or at least, probably several thousand dollars' worth. 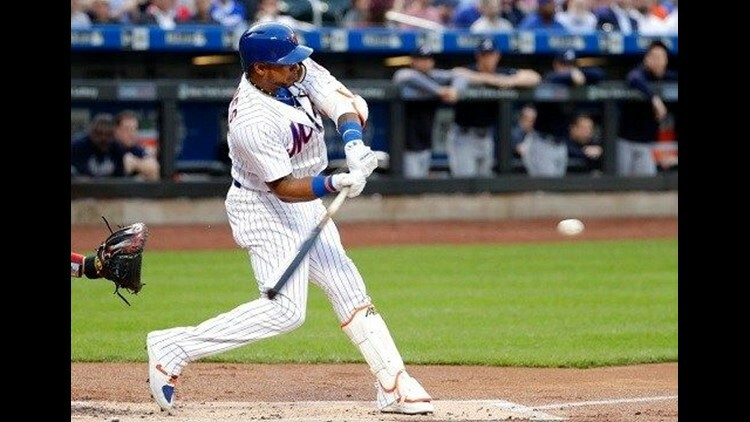 NEW YORK (AP) — Yoenis Cepsedes left it all on the diamond Wednesday night — or at least, probably several thousand dollars' worth. The New York Mets slugger snapped his glitzy necklace during a hard slide into second base in the first inning of a game against the Atlanta Braves, scattering gems around the infield. Cespedes hustled into the bag after blooping a ball down the right field line, and second baseman Ozzie Albies jumped over him while receiving a throw from the outfield. Cespedes was stretching after the play when he noticed one of his necklaces was broken, pulled it off his neck and furiously threw it to the ground. The Mets telecast showed what appeared to be diamonds glistening in the dirt near the bag. A half-inning later, New York second baseman Asdrubal Cabrera and second base umpire Bill Welke stooped around the base, apparently picking up pieces of the necklace. Cespedes also inspected the area on his way out to left field prior to the third inning, but seemed to come up empty. During last year's AL Championship Series at Yankee Stadium, Houston pitcher Lance McCullers Jr. snapped his necklace made of black diamonds while on the mound. He spent a lengthy replay challenge digging the diamonds out of the dirt.